Lightly tender on the outside, yet moist, ooey, gooey and loaded with chocolate on the inside, this brownie takes just one minute to whip up and is secretly healthy! Made with no butter, oil, grains or sugar, it’s naturally gluten free, vegan, paleo, grain free and can be made sugar free! Yes, I went and bought baby food, purely to be in possession of mashed peas. In full disclosure here, I had no intentions of sharing a brownie recipe today. When this crew suggested ‘peas’ as this month’s theme, I was pretty excited to give my mum’s classic pea and pesto risotto a healthier and dairy free makeover. Unlike some of my other recipes, I didn’t need to go back to the books to experiment as I used my standby pesto recipe (which was naturally dairy free) and tossed it through some pre-made risotto, made with almond milk and earth balance (a dairy free butter substitute) for extra creaminess. Once mixed, I stirred through the peas and it was delicious. It was delicious…when reading the description out loud. It was NOT delicious to look at. This might be a big call, but the intended recipe for the round-up was perhaps the most visually unappealing bowl of risotto you’d ever have set your sights on. No matter how much extra peas I placed throughout, a dash of nutritional yeast here and there and some sprigs of herbs- No. It was a fail whale in the looks department. Clearly, if all else fails, I fall back on something sweet, but peas in something sweet? I’m sorry, but I just can’t see that happening…..or could I? I remember when I first shared my infamous 3 minute microwave English muffin recipe and how some readers had trouble finding mashed pumpkin, especially those in countries outside of America. I remember testing out BABY FOOD (essentially pureed carrots and parsnips) and it working out almost perfectly and verbatim to the pumpkin. I recall seeing baby food which included peas so thought I could sub a recipe using canned pumpkin or pureed peas, but mask the taste with the other ingredients. Friends, your (healthy) brownie doesn’t just take one minute to make, but it has peas in it too. 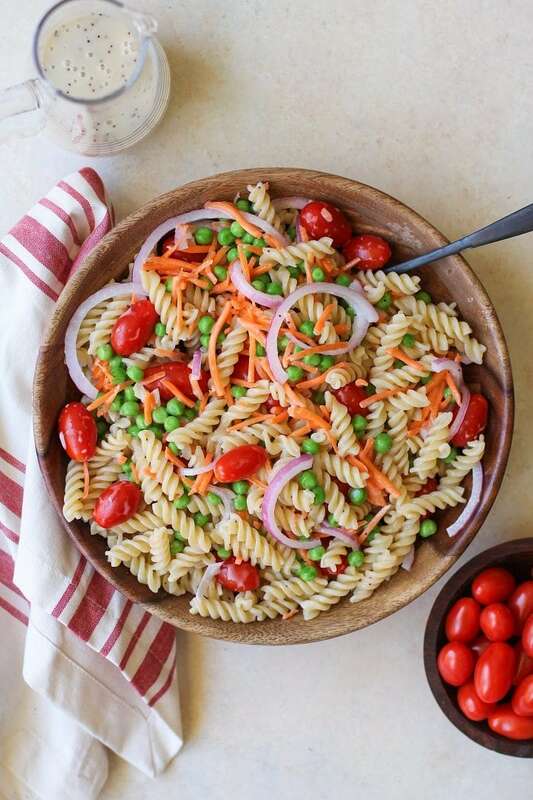 Julia shares this Pasta Salad with a lemon poppy seed dressing. 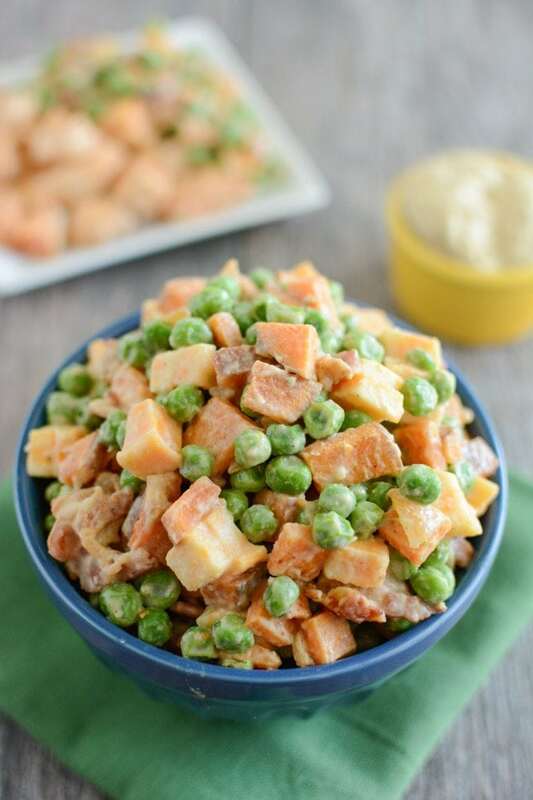 Lindsay has this Pea Salad with Sweet Potatoes. 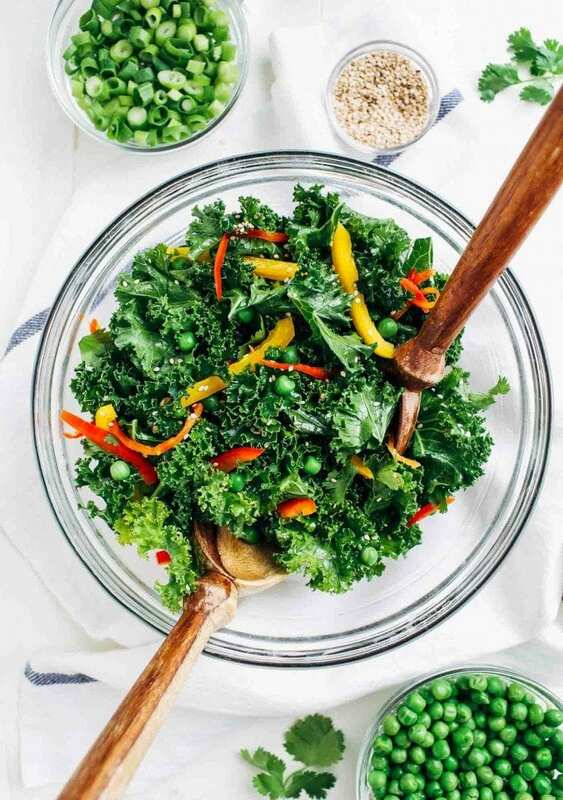 Sarah shares this Kale Power Salad. 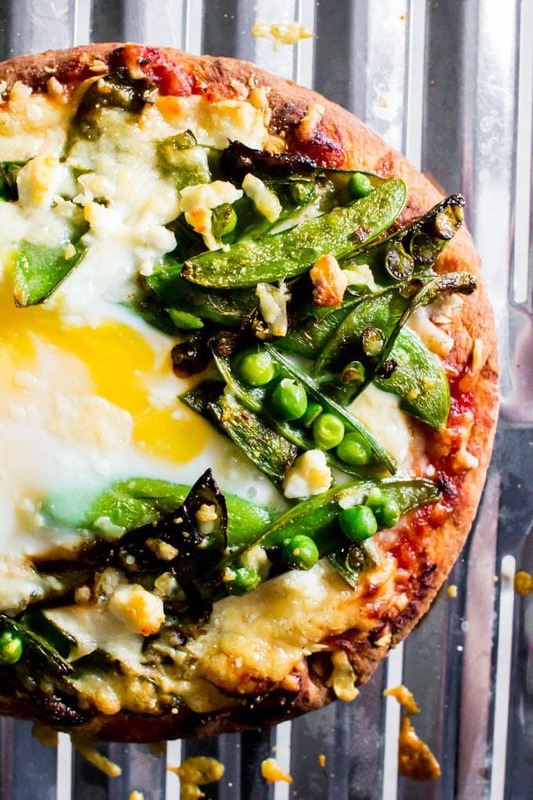 Kylie shares this Naan Pizza with Sugar Snap Peas and Goat Cheese. 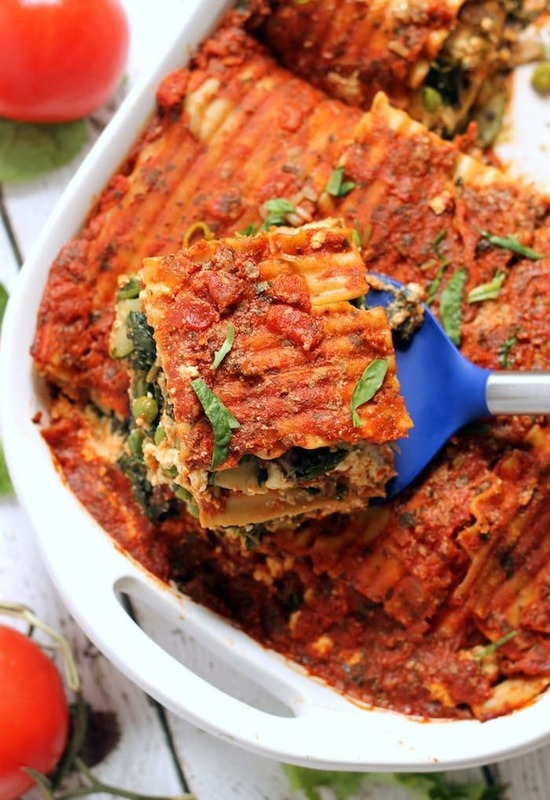 Alexis shares this Easy Vegan Lasagna. Now it’s my turn to share something sweet after all this greenery in chocolate form. 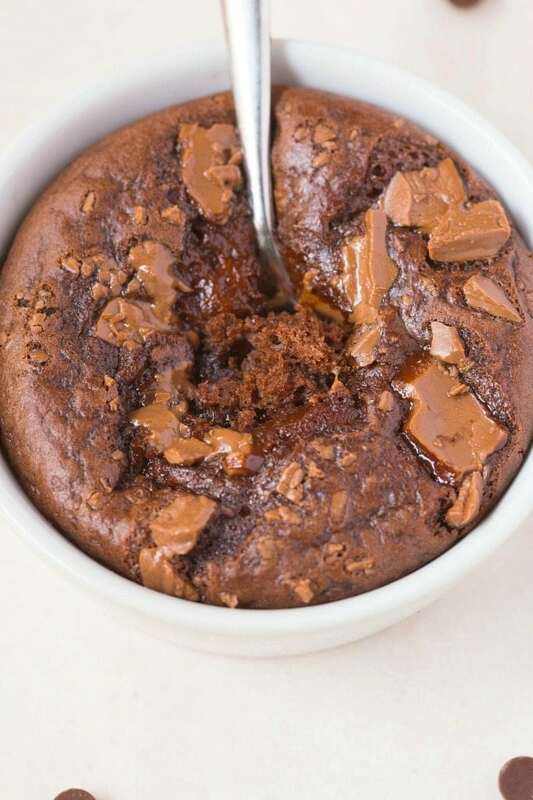 This healthy chocolate brownie is moist, gooey and loaded with chocolate goodness and literally takes less than a minute to whip up! 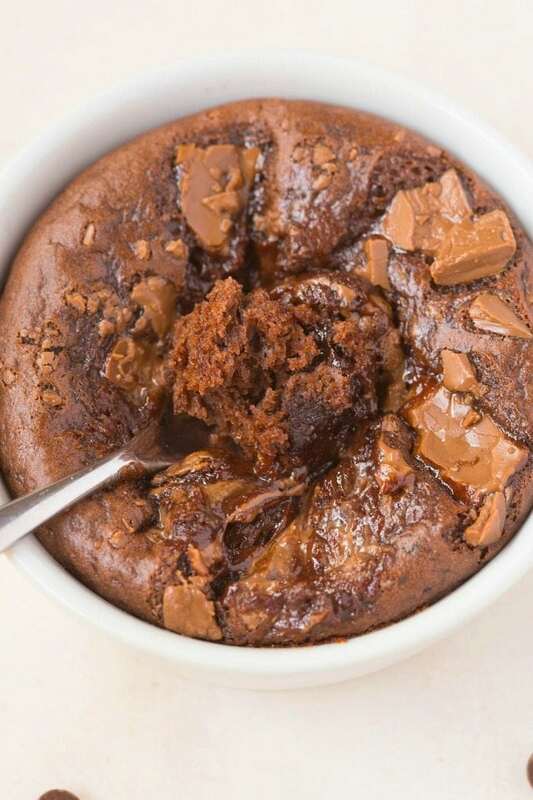 It’s super moist, oooey and gooey in the centre and ‘just’ tender on the outside- pretty much the ideal brownie texture! It’s also the perfect, portion-controlled snack or dessert to cure any sweet tooth which requires minimal prep and no mess! Unlike traditional brownies which rely on butter, oil, flour and sugar for the best taste, these use NONE of those, but you’d never be able to tell! Because of the ingredients used, it’s also naturally gluten free, paleo, vegan, dairy free and can be completely sugar free too! HACK! Because the mashed peas are only used for its texture/adding moisture to the recipe (to replace butter), if the thought of using pea based baby food puts you off, your fine to sub in applesauce, mashed pumpkin, mashed sweet potato or any fruit/vegetable based baby food- Just ensure it is unsweetened. Make this healthy 1 minute brownie, but feel free to come over for visually unfortunate risotto. Lightly tender on the outside, yet moist, ooey, gooey and loaded with chocolate on the inside, this brownie takes just one minute to whip up and is secretly healthy! Made with no butter, oil, grains or sugar, it's naturally gluten free, vegan, paleo, grain free and can be made sugar free! In a separate small bowl, combine the milk of choice with the egg (or egg white) and whisk with the vanilla extract. Add the pureed peas/mashed starch and add the mixture to the dry mixture and mix until just combined. If batter is still crumbly, continue adding dairy free milk one tablespoon at a time, until a thick batter is formed. Grease a microwave or oven safe bowl generously and pour the batter. Top with optional chocolate chunks and microwave for at least 50 seconds, depending on the microwave. Add the dairy free milk and vanilla extract (I needed around 5 tablespoons) until a thick batter is formed. Transfer to a greased bowl or mug and top with dairy free chocolate chips/chunks and bake for at least 50 seconds (some have needed to go up to 2 minutes). Follow directions as above but bake in a preheated toaster oven or oven for 12-15 minutes, or until 'just' cooked in the centre. 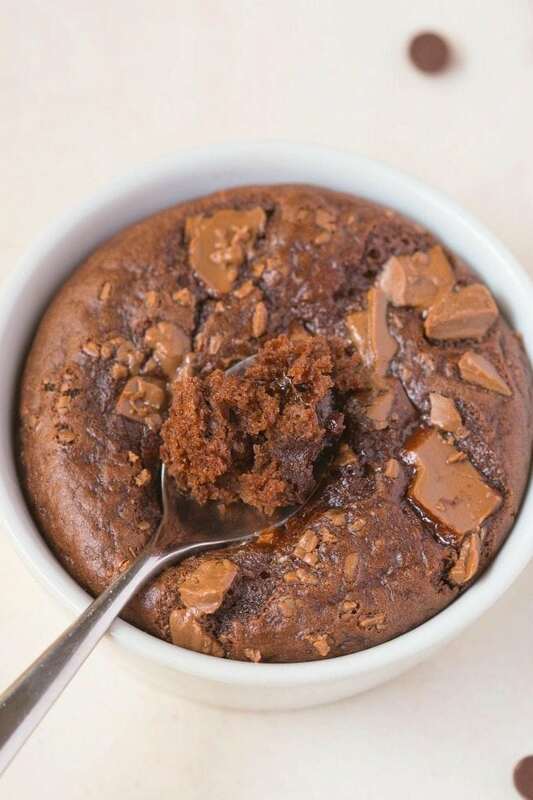 For a more ooey, gooey brownie, aim for 50 seconds and ensure there are chocolate chunks/chips in the centre. What is your favorite way to enjoy peas? IN RISOTTO. Have you ever tried baby food as an adult? Not by itself…. Peas in brownies? Ummmm what?!? Definitely trying!!! You are so creative! I love pea soup, eaten cold. Sorry not sorry, it’s summer here so soup should be cold. Interesting idea for a brownie, I’ll have to try it. Hope you enjoy my recipe, Ellie! LOL my current favorite way to eat peas is snap peas + hummus, but I’m pretty sure this is my new favorite. Ohhhh snap peas….I love them raw! Peas in a brownie?!?! I am so interested in trying that! i never would have thought of using it in baking 🙂 and lately I’ve really been loving peas in general, so it’s no coincidence! I remember you telling me that haha! Seriously, so smart! Whaaaa? Peas in brownies? Crazy! You’re always thinking of the healthy stuff, meanwhile I’m digging into chocolate fudge pie from the grocery store lol. I actually remember loving peas as a kid and for a while it was one of the only vegetables I liked. I still love them, they’re definitely one of the sweeter green veggies so I can see how this works. OMG. How had I never heard of that store before? I hope you and Riley enjoyed those goodies! I tried this to a T with a flax egg instead of real egg and it just never seemed to bind 🙁 it was mushy and flat. I cry. Saved with a lil ice cream though so s’all good. As a small child (about 1-4 years old), I used to eat frozen peas right out of the bag, like candy, so this recipe is right up my alley! 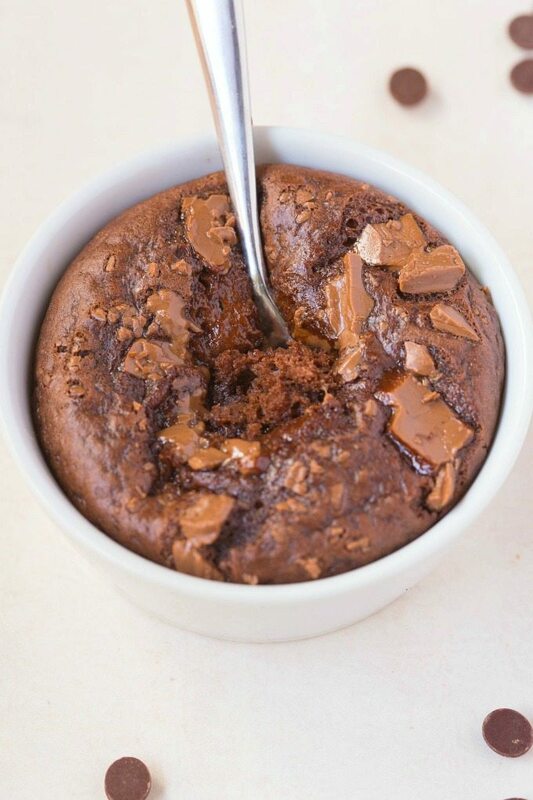 I’m always looking for new chocolate mug cake recipes since I have a perpetual sweet tooth. I can’t wait to try this brownie, chocolate chips all warm and melty, topped with a big ‘ole scoop of mint chocolate chip Nada Moo Icecream! Please do- I think you’d really enjoy this! 🙂 I loved frozen peas as a kid too! You are seriously a magic man? I want this in my face. Do you know of a paleo friendly flour that I can sub in place of the coconut flour? Thanks! Just stumbled across your website and am impressed with what you offer. A healthy One-Minute Brownie? Sign me up! Thanks for posting and I am looking forward to more. Hi Raschell- You are so welcome, thank you! Arman, I love this idea and want to make it for my cooking class (I teach cooking to young kids) can you give me the updated recipe for 18 kids? Hi Amy! I think you’d be better making the 3 Ingredient Flourless Brownies instead- You could make 3 servings. I couldn’t because of a nut allergy. I tried this, it worked well.